capable of handling any source. 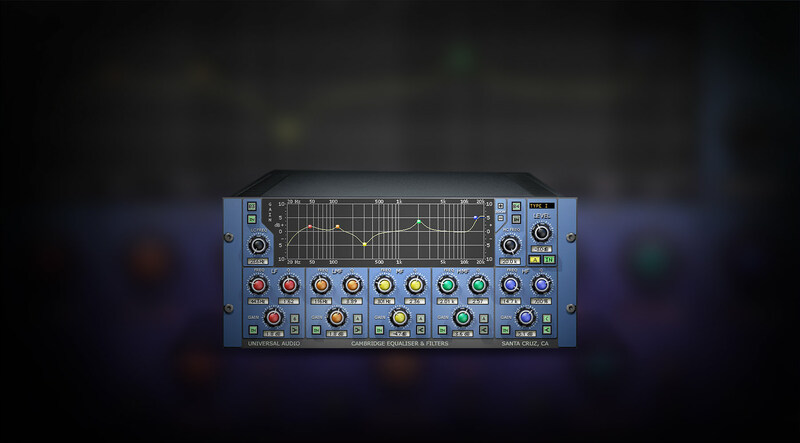 The Cambridge EQ plug-in for UAD-2 hardware and Apollo interfaces is a “go to” tool for professional engineers looking for powerful tone shaping with smooth sonics. Whether you’re putting the finishing touches on a master, radically reshaping tracks, or fixing problem areas from poorly recorded sources, the Cambridge EQ plug-in is a must-have tool for every engineer’s toolbox. I needed a linear eq and this is the best eq that i found..low DSP with a great sound response. great plug in!!! I needed a linear eq and this is the best eq that i found..low DSP with a great sound response. I was on the fence about purchasing this plugin. I desperately needed a solid parametric EQ as my "go-to's" were leaving something to be desired - especially in the higher frequencies (5k and up). After reading the reviews and demoing the plugin extensively, I decided to bite the bullet. I'm so glad I did. The Cambridge puts every other parametric EQ in my plugin folder to shame. It can do everything from surgical EQ work to broad stroke boosts and cuts, all handled with ease. The high and low pass filter options are UNREAL! I have never heard a filter set with so few phasing issues. Add to it that the plugin only consumes 1% DSP power per instance and it's no wonder this little gem has risen above the rest of my EQ's. A must have! A very nifty little eq with great sound and nice filter options. I find myself using many instances of it - and its low DSP hit - for adjusting tracks, groups and effect returns in the beginning of a mix for which I might end up using the bigger (massive passive) or more colorful (eg Pultec and Trident) guns. But often the trusty Cambridge stays, at least for hi/lo passes and more surgical cuts. It gets a lot of use and I'm very happy with this eq. I use a variety of different eq's and this one was recommended by a colleague. My original intention was to use it for a specific purpose but frankly I've ended up using it all over the place - it's as at home on a channel strip as it is on the output bus. It's one of those plugins that seems to have its own sound - a warm & slightly tubey hifi quality. Wherever I've used it it just seems to make everything sound ... well, nicer. I know that's not a particularly helpful technical analysis, but it's the best way I can describe it. Things just sound nicer. After buying the UAD- 2 Octo Core question arose about the equalizer as a working tool in my work. Heard a lot of good things about Cambridge EQ Plug-In. Very versatile can be used to track channel and master. Immediately decided to try. Comparing Eq Channel included in the program Logic Pro 9 so badly disappointed . So many years have used this Eq Channel but when compared with Cambridge EQ Plug-In - Hi Pass filter is not correctly cut the lower frequencies ... had to choose cutoff frequency only was more audible effect . Cambridge EQ Plug-In when choosing the same value immediately heard his work. a subtle and precise tool! This is a good solid eq to turn to when other eq's can't do what you need to do!!! parameters, which are pretty intuitive to handle. I use this EQ on every single track I produce. I do use other plugins like flux and waves, but this baby is my workhorse. Having access to the butterworth 3-6 filters is helpful in getting my basses and kicks to sit perfectly in the mix. Wonderful EQ, very responsive and sensitive with great musical response and the highest point is the filters. The most complete tool EQ I've ever used. When it comes to EQ, I'm a bit of a control freak. Broad, colorful EQs have their place, but more often than not, I need something surgical too. For a long time, the Cambridge was the only EQ UA had that could do surgical, and frankly for that purpose it's a bit too colored for my taste. So why four stars? The filters. The filters on this thing are amazing, and offer unmatched control. Like the rest of the Cambridge they're not uncolored, but with care they can do awesome things. While the upcoming Brainworx BX Digital will largely supplant this plugin for me, and 88RS is a better surgical EQ, for someone with a just a UAD-1 this plugin is still a no-brainer for the filters. Firstly I own a Crane Song Ibis, hardware. I looked hard and listened hard to the Sonnox eq trying it out as you do. I had been looking into UAD Omni for some time and unfortunately no trials which is understood. I had Pro Tools 7 through 8.4 and except for the later 8.4 the plugins were, well, agricultural and not a pro vibe. All promises and little joy. I read countless reviews of all software equipment and trialed the big name eq's of the time. The vibes I got on the UAD software although in minor numbers were definitive and when I got together my courage and purchased the whole Omni I was not disappointed. The Cambridge eq, to my ears does everything in a musical fashion, it does everything well except make shrill edgy highs and muffled lows. The Cambridge eq is in control of what audio passes through it and the test is what feeling you get when you listen to the audio passed through it. The Sonnox to my ears is the other eq that passed my tests and I think the Cambridge most certainly is up there in it's own space. I have no need to purchase Sonnox now, I think the Cambridge is wonderful. I have to say here that I recorded to tape for many years and although in pro studios it was a Studer 24 track, at home it was just a Tascam 38. Well when I heard the Cambridge I thought my journey for gear that sounds good and does what it was designed to do was over. This puts it in a nutshell really. A Fantastic EQ! The filters are amazing. I just finished mixing the new Clint Eastwood Film. The score was made up of a 60 piece orchestra featuring 2 Harps, Solo Piano, Acoustic Jazz Bass and 2 Acoustic guitars( Nylon and Steel string). All playing live in the same. Harps were filtered at 80hz as well as the Acoustic guitars. Some carving EQ on the harps at 300 hz with some top added 1db @ 8k an 5.6k to the guitars for some sparkle. The Piano high mic was rolled off at 50 hz the low at 30hz. This was only EQ applied to the Piano. Jazz Bass 2db @ 63Hz and 1.5 db @ 2.4K. I just tested it in demo mode, but I can say it's a great-sounding and very powerful plugin. An additional spectrum analyzer function would make it an even greater tool, for mastering purposes especially: if it will be implemented in the future, I will not hesitate a millisecond to buy it! The only thing I don't like about it is the interface. I would love it if UAD remade the interface. Other than that, it does everything I want from a surgical EQ. I remembered when I used uad-1. This is very simple but Effect is Good! My vacal have a color by Cambridge EQ . TO DO MIX ! with My instruments. It is hard work to me . But I expect . Because My Uad-1 upgraded by Uad-2. I will try about many time . Thank you for read my words. Bye ! Most similar plugins (ReaEQ, etc) have a real time frequency analyser. This one really should. It doesn't sound particularly great, but if it had the right features it might be useful. Another disappointment from UAD. 4 Stars for the EQ works great, a bit buggy in my DAW. Love the elliptical presets.